The cost to drill a well in Vancouver is available online for water well drilling, well pump services or Metro Vancouver Geotechnical services. At Vancouver Well Drilling & Geotech Services, we prepare detailed estimates for well drilling, water well repairs, geotechnical solutions including well pump installations & well pump repairs. For the current cost to drill a well or water well pump service fill out the form below to request a quick estimate. Please include a few basic details about the property or project information to help us prepare a detailed well drilling cost estimate or service quote. If you do have a well drilling or water well pump question, please add them the quote request - we will be sure to respond quickly. Thank you... you’ll hear back from us soon! To request a well drilling price, please submit your information, we respond quickly to all requests. Your information is always private and is only used to provide a detailed well drilling cost estimate for drilling a well or geotech services in Metro Vancouver. Vancouver Well Drilling provides value to our customers by delivering high performance drilling services to every project. Our Greater Vancouver service area covers Vancouver, North Vancouver, Maple Ridge, Anmore, Coquitlam, Richmond, Steveston, Burnaby, New Westminster, Port Moody, Coquitlam, Port Coquitlam, Delta, Surrey, Ladner & Tsawwassen. We consistently provides reliable service through our experts well drillers, water system professionals, up-to-date technology, and organized systems. Vancouver Well Drilling & Geotechnical Services delivers maximum efficiency, helping our local customers minimize risks and reduce well drilling costs. Our highly proficient and competent water well crews provide quality, safe, consistent, and reliable services throughout Metro Vancouver area. Our Greater Vancouver services include not only water well drilling but geotechnical solutions, municipal and industrial wells, artificial storage, and recharge (ASR) wells (also known as injection wells), geotech drilling, potable wells, large diameter production wells for agriculture, well pump systems, well pump repairs, complete water systems, water filtration, and water well repair services including rehabilitation for water wells throughout Metro Vancouver. Looking for the cost to drill a well? 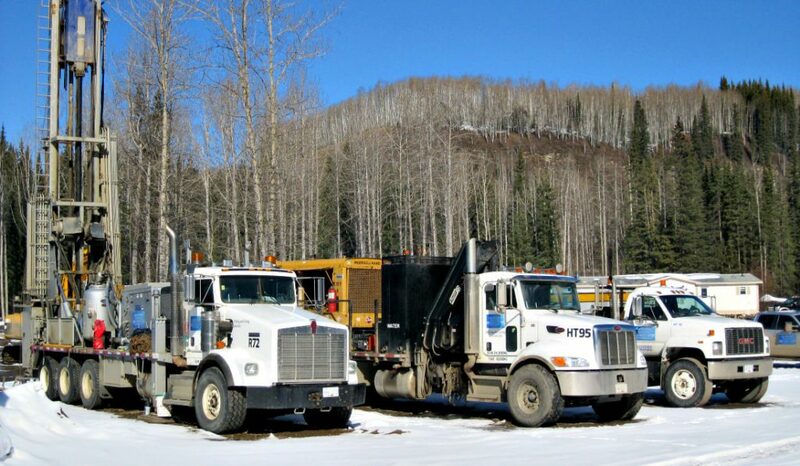 Vancouver Well Drilling is highly-equipped to perform all drilling projects at a high-level. We specialize in local domestic water well drilling, commercial or municipal water well applications, large-diameter irrigation wells fully serving the agriculture industry demands with reasonable water well drilling costs. We’re also geared-up to drill in many unique formations including remote drilling locations utilizing Heli-portable equipment for affordable access of well drilling equipment. For large well drilling demand, our DR-24 Barber drills can install wells from 6” to 22” diameter and up-to-depths that can exceed 1,000 feet. Vancouver Well Drilling & Geotech Drilling Solutions has innovative drilling equipment, we can manage the most specialized of drilling projects. With the capacity to modify existing well drilling equipment to meet very specific well drilling requirements. Vancouver Well Drilling will provide a detailed report of the local well drilling cost for domestic water well drilling to the much larger specialized drilling projects including geotechnical services. Our specialized water well abilities would mean very little without our exceptional well drillers and other experts on the team, they set us apart from other local well drilling companies. Our combined experience has brought us an exceptional level of success serving the Vancouver and the surrounding areas. Call Vancouver Well Drilling today for the cost to drill a well, install a water well pump or any of our other specialized services. Our highly proficient licensed Vancouver wells drillers are experience with some of the most difficult drilling conditions in British Columbia. Their broad-scope of drilling experience encompasses residential, environmental, governmental, commercial, institutional and industrial projects. The work completed by our well drillers is accomplished by utilizing a variety of modern drilling techniques using the right equipment for each job. We appreciate our Vancouver clients and proudly drill premium water wells and are sharply focused on our ability to offer specialized services. Our ability to provide outstanding water well services would not be possible without our highly appreciated drillers and well pump experts. Call Vancouver Well Drilling or request a detailed FREE online well drilling quote. We also provide quick water well pump replacements and well pump repair estimates online for Greater Vancouver including all emergency services. Looking for Vancouver Geotechnical Services, Geotech Investigation or Geotech Drilling solutions in Vancouver? We are fully equipped to rapidly drill and sample challenging formations and provide the most cost-effective solution for environmental investigations. Vancouver Geotechnical with teams that are adaptable to any Geotechnical project in British Columbia along with one of the most comprehensive inventories of sonic drilling, core sampling, and insitu testing equipment in the Geotechnical industry. With the ability to quickly deploy a wide-range of drilling systems from man portable drills, to large machines such as our extensive variety of Sonic Drills in Greater Vancouver or Dual Rotary Barber drills. Vancouver Geotechnical Drilling services completes drilling projects throughout British Columbia including exploratory wells, geotechnical holes and instrumentation holes with depths that have exceeded 100 meters. We provide drilling services throughout Metro Vancouver from Water Well Drilling to a broad-range of Geotechnical services. Geotech investigation services include, but are not limited to, mineral exploration, water wells, excavation shoring and pile foundations, Helical and screw piles, grouting, environmental drilling, and explosive compaction. With extensive experience in geotechnical drilling, core sampling and in-situ soil testing with off-shore marine drilling experience in the geotechnical field that is unparalleled in Canada! Vancouver Geotechnical Drilling Solutions is a highly skilled team focused on continually implementing the most technologically advanced drilling techniques to increase the efficiency and the accuracy of field data collection. Whether it's underground rigs, truck mount rigs, track mount rigs or heliport-able we're able to manage any application. Vancouver Well Drilling - we're equipped to handle all well drilling projects regardless of project size or requirements. We're the Metro Vancouver experts from small diameter well drilling, Vancouver geotech services, commercial water-system projects, and large diameter production wells for the agriculture sector through-out British Columbia. Fully prepared to drill for water in any of the Island's formations with the ability to set-up for drilling throughout remote areas of the British Columbia or remote locations where traditional drilling rigs and other equipment cannot gain access. We have the ability to utilize our Heli-portable HT-500, HT-700 and our HT air-compressors, we're always prepared to perform at any level required. No problem with our ability to handle very large drilling projects either, we're also equipped with DR-24 Dual Rotary Drills and able to drill from 6” to 24” diameter and to depths that have exceeded 1,000 feet. We have engineered and constructed innovative well drilling equipment available to meet all Vancouver Island water well drilling requirements, with the ability to carry out the most specialized of drilling and geotechnical projects. With any water well drilling method in Vancouver the permeability of the formation around the bore-hole is reduced. Here's an example, with the cable tool method of drilling for water, compaction and clay-smearing occurs. With the wet rotary drilling method, fluid infiltrates the aquifer and when reverse circulation is used, water that is loaded down with fines can often obstruct the formation as a vacuum effect occurs around the drill bit. Water well development in Greater Vancouver is demanding and important for quality water well completion to maximize the efficiency of a well by rehabilitating the aquifer after the disruption caused by the well drilling process. Fine-particles surrounding a well-screen must be removed from the area to increase the permeability of the aquifer, with the use of air and unique surge-methods at Vancouver Well Drilling we greatly enhance our water well development process! It's worth taking time to do RIGHT! 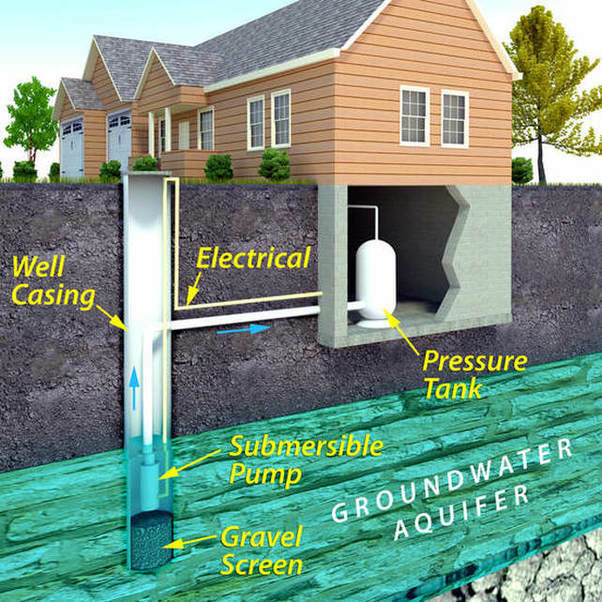 Vancouver Well Well Drilling understands the importance of water well-screen design, careful sizing of a well screen is, without doubt, the most important consideration when constructing an efficient water well. A properly selected well screen is designed to serve two basic purposes: to allow the unobstructed entry of clean-water free of sediment entering the well, and to allow a maximum flow to the formation for water well development procedures. 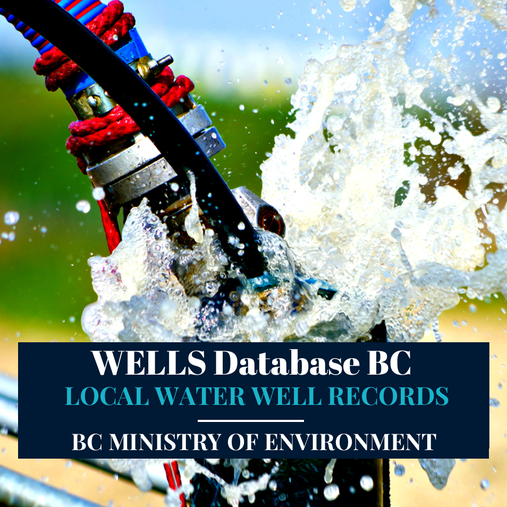 BC Ministry of Environment WELLS Database Vancouver, North Vancouver, Anmore, Belcarra, Coquitlam, Richmond, Steveston, Burnaby, New Westminster, Port Moody, Coquitlam, Port Coquitlam, Delta, Surrey, Ladner & Tsawwassen. The WELLS Database for the Metro Vancouver communities is regularly updated and managed by the British Columbia Ministry of Environment. The provincial government's iMapBC is an important online portal to a wealth of open government data for the Vancouver area. A valuable water resource, WELLS Database Vancouver is a self-serve online system, free of charge - available for public use, it you need any help please contact our office, we're available to answer questions. Along with the British Columbia Water Well Regulations, Resources and the Greater Vancouver Well Search Tool, you'll find the provincial land-use requirements, setbacks, Vancouver Coastal Health, BC Water Rights Database and other pertinent water information and regulations with down-loadable reports and website links. Vancouver Well Drilling provides BC Well Drilling Regulations for the Metro Vancouver communities, Canadian Drinking Water Guidelines is included in the official WELLS Database Vancouver Water Resource Library is hosted by Vancouver Well Drilling & Pump Services. Not all water wells are drilled deep in Vancouver, in fact many water wells may be less than 200' deep. If a water well is located near potential sources of contamination it is vulnerable and can become contaminated with the possibly of causing serious illness or even death. British Columbia Water Well Regulations and the Ministry of Environment set-backs for water well in Vancouver are required to protect water resources from becoming contaminated from a multitude of possible sources. To understand comparable well drilling depths in Vancouver, it's best to locate the Ministry of Environment set-backs and refer to your local resources including well drilling reports, resources are available at BC Water Well Search and local community bylaw offices. A water well drilled in Vancouver or any of the surrounding communities should be located on higher ground when possible to protect the well head from normal or seasonal flooding and possible surface drainage. Both shallow wells and deep water wells can become vulnerable and should always be located away from surface drainage-ditches and other possible problems and sources of contamination.